Amusement park rides, particularly rollercoasters, operate under an unspoken assumption of safety that’s not unlike that of film going. As they buy the ticket, sit in the seat and have that safety bar drop over their laps, customers can feel confident that although they may experience thrills and maybe even terror, they will never be in real danger and when the ride stops, they will walk away intact, if perhaps a bit nauseous. But what if someone decided to violate that tenet? What if someone used that moment of total vulnerability to strike and the illusion of danger became real? That’s the chilling concept at the heart of Rollercoaster, a criminally underrated suspense thriller from 1977. For a film that no one seems to talk about, you can see a lot of the DNA of many modern action and suspense films coiled into its taut two hours, along with the kind of patient, intelligent plotting and intriguing characters that are too often lacking in contemporary examples of the genre. 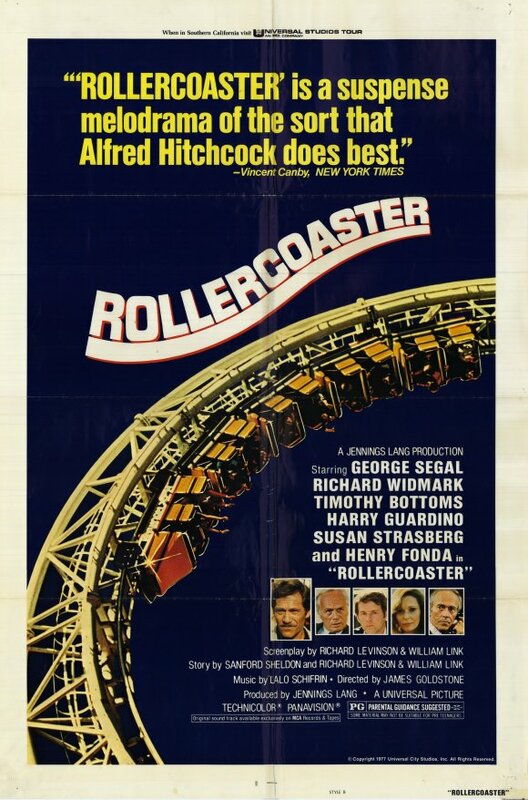 The premise is simple: A clean-cut looking young man (Timothy Bottoms) is planting bombs on amusement park rides, the results of which are displayed gruesomely in the opening sequence as he detonates one on the track of a rollercoaster, causing it to fly off the rails into the park below. Harry Calder (George Segal), a safety inspector responsible for checking that particular coaster, feels a personal stake in determining the cause of the crash. A second accident leads him to discover that the bomber has threatened to unleash further mayhem unless he’s paid a million dollars by the owners of several amusement parks. Calder warns them to take the threat seriously, an opinion that earns him the bomber’s attention and forces him into an uneasy alliance with prickly federal agent Hoyt (Richard Widmark) to trap the suspect. It’s surprising that director James Goldstone didn’t go onto bigger things because he shows a sure hand wringing the maximum tension out of scenes, beginning with the opening sequence in which we intercut between the screaming, excited passengers on the rollercoaster and Bottoms serenely prowling through the park, patiently waiting for the right moment to unleash chaos. The resulting carnage is extremely brutal and affecting not so much because of the considerable violence of it (which was reportedly cut down following test screenings) than because the casualties are personified through multiple shots that emphasize the victims enjoying themselves before the crash and then the horrified reactions of bystanders who witness it. After that, we’re relieved when the second bombing is elegantly understated: Bottoms, renting a car, passes an ad for a park identified by a rainbow logo and we cut immediately to emergency vehicles speeding through the park’s rainbow-shaped gate into the smoky aftermath. Rather than huge action set-pieces and big explosions, the real emphasis is placed on the procedural duel between the criminal and the authorities. “Always thinking, aren’t you?” Hoyt glowers as Calder suggests a course of action. “So’s he,” Calder responds. We watch as the FBI anticipates the bomber’s plan and sets their traps, only to have Bottoms anticipate those and improvise counterattacks, with poor Calder caught in the middle of it. Then there are the coasters themselves. Filmed using camera mounts that put us in the front car and tuned up acoustically for the Sensurround format (more on that later), each roller coaster gets exhibited in vertigo-inducing shots that are still effective when viewed on television. I can only imagine how they must have looked on a big screen or how they could have benefitted from IMAX photography. There’s also an excellent use of sound to keep us off-guard, such as during a tensely quiet scene of bomb squad personnel gingerly attempting to disarm one of Bottoms’ explosives that is interrupted by a jarring cut to an extremely loud ringing phone. Bottom’s unnamed extortionist (identified in the credits only as Young Man) is superbly effective, particularly considering (and probably because) he remains a blank slate to us throughout the film. Allegedly an opening scene was shot that would have spelled out his motivations but it was wisely deleted, allowing the character to remain chillingly anonymous and totally unsympathetic. Soft-spoken and displaying an economical physicality that allows almost no wasted movement, Bottoms makes blandness compelling. Unlike Dennis Hopper’s cackling, one-liner spouting baddie from Speed or John Travolta’s obnoxiously verbose hijacker from the remake of The Taking of Pelham 123, he doesn’t oversell his villainy, content to allow the discontinuity between his perpetually calm, polite demeanor and his ruthlessly violent crimes to scare and fascinate us. He spends much of the film quietly observing, often behind a pair of binoculars, or camouflaged in the crowd as Harry and the police obliviously pass him. For a contrast, there’s our much put-upon hero. From his first scene, in which he receives repeated electric shocks as part of aversion therapy to quit smoking, Calder seems to take a lot of abuse and harassment, responding with a sense of resigned, caustic humor that can’t help but make us empathize with him. Watching him get pushed around by his boss (Henry Fonda) or awkwardly greet his ex-wife’s current boyfriend (who's wearing Harry’s robe) makes it that much more satisfying to see Harry assert himself by pushing his way into the investigation or matching the bomber’s serene menace with snarky annoyance over the telephone. Even without sharing much screen time together, Segal and Bottoms develop a great chemistry, foreshadowing the long-distance antagonism of Bruce Willis and Alan Rickman in the first Die Hard film or Clint Eastwood and John Malkovich from In the Line of Fire. Gruff FBI agent Hoyt is a pleasant change from the stock law enforcement foils we've grown accustomed to. How many films have we seen where authority figures such as cops or feds are depicted as ludicrously stubborn or wildly short-sighted, serving no purpose but to enhance the hero’s better qualities by getting in the way? Even as great a film as Die Hard falls into this trap with Paul Gleason’s priggish deputy chief. In contrast, Hoyt is always presented as a sensible, competent investigator. From the moment he enters the film, he is following up clues and considering avenues of investigation. As much as he patronizes and is annoyed by Calder, we see he recognizes the value of his input. This is illustrated by a nice little moment in which, after angrily dismissing one of Harry’s theories, Hoyt changes to an almost conciliatory tone and urges Calder to keep passing on any other ideas he might get. There are some more familiar faces in the supporting cast, including character actor Harry Guardino, a bit underused as a detective on the case, and Susan Strasberg as Harry’s extremely patient girlfriend. There are also notable early appearances by Craig Wasson as a stoned park patron, Steve Guttenberg as an FBI agent and Helen Hunt in her debut as Calder’s daughter. It’s strange to say it but one of the few sour spots of casting is Henry Fonda. Though featured heavily in the film’s promotion, his role as Calder’s disapproving boss is little more than a cameo in two brief throwaway scenes. Having an actor of his caliber in such a minor role is somewhat distracting and he never even gets a scene with Widmark, a frequent co-star of his following Madigan and The Swarm. Another key element in the film’s success is the music score composed by Lalo Schifrin, who is perhaps best known for creating the classic Mission Impossible theme. He nicely balances gaudy carnival themes with icy, Herrmannesque suspense cues. His theme for the bomber starts as an elegant string quartet piece until the ominous screeches of the violin take over, musically suggesting a twisted mind beneath a wholesome exterior, while his jazzy theme for Calder brings to mind the lonely end titles he composed for the original Dirty Harry. While it did decent box office at the time, Rollercoaster failed to catch on with audiences overall, and there are several possible reasons why. First, the film was mislabeled and promoted as a standard disaster flick and as the 1970s progressed, that genre had begun to wane in popularity. Secondly, Rollercoaster was filmed in the widely touted but ultimately unsuccessful Sensurround process, in which additional speakers were installed in theaters to increase the bass levels of sound effects, primarily the ride sequences in this film. The process was expensive for theater-owners, known to cause damage due to the intense vibrations and resulted in audible bleed-through for audiences in adjoining auditoriums. And finally, another film opened that same summer that kept audiences busy, a humble story involving droids, spaceships and Jedi. Perhaps you know of it? While it may have been overlooked by most, Rollercoaster may have had more of an influence than one would think. Watching Calder being forced by the bomber to play carnival games and suffer through rides during the money drop sequence, you may be reminded of John McClane being put through his paces by Jeremy Irons’ terrorist in the third Die Hard, while the epic “That’s him!” moment when Calder finally sees his enemy amidst a crowd is echoed in Eastwood’s first glimpse of Malkovich from In the Line of Fire. In terms of its own cinematic ancestors, one can see the seeds for many of Rollercoaster’s concepts and conventions in thrillers of the 70s such as Day of the Jackal (authorities struggle to outwit a shadowy cipher of a criminal) and The Taking of Pelham 123 (everyman civil servant is pitted against a cold-blooded extortionist). Considering how far the remakes of those films missed the mark, exchanging intelligence and tension for noise and flash, it’s probably a blessing no one has seen fit to try again with this one. As anyone who loves old-fashioned wooden rollercoasters knows, you can't beat a sturdy, well-constructed thrill ride. Vastly underappreciated film. The opening cash sequence is still scary as hell. I agree and I think it's because that opening is so strong that the film manages to be suspenseful without focusing too much on the violence. It makes the stakes clear without being gratuitous.